In a bid to save cash, customers who used to buy others' work are now sewing, knitting their own creations... read the full article in last week's Globe and Mail. 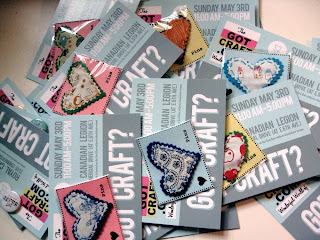 Since I don't like to post without pictures, I have included a snapshot of the swag going off to the Handmade Nation premier in Portland this weekend! To check out what else is in the bags, visit Kate from Obsessive Consumption's flickr account. Friday and Saturday is sold out, so if you are interested in heading down there, make sure to grab ticket's for Sunday's screening! For more information, please visit the Museum of Contemporary Craft. Hope to see you there.